CPVC has similar, but generally better, chemical resistance and physical properties than PVC. Joining methods are by solvent cementing, threading (Schedule 80 only) or flanging. CPVC has been used successfully for process piping, for hot corrosive liquids, and in hot and cold water distribution. Pressure ratings given are for solvent-cemented systems. When adding valves, flanges or other components, the system must be derated to the rating of the lowest component: threaded ratings are 50% of solvent cement systems; flange fittings are 150 psi. 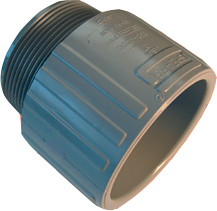 See manufacturers recommendations for other fitting and component ratings. Handles temperatures up to 210 F.
Not affected by soil in buried applications; requires water-based latex paint for outdoor, sunlight-exposed installations. Self-extinguishing; will not sustain combustion. Material conforms to ASTM F441, Type IV, Grade 1. National Sanitation Foundation (NSF) approved for pipe sizes 1/2 through 14 for use in potable water service. Standard length: 20 feet; medium gray in color.